In the brief lull between New Year and Chinese New Year, we have been taking a look at some new restaurants, and also dropping by an old favourite that has recently reinvented itself. We looked at Odtomato, an oddly-named Mod-Oz restaurant that takes its name from owner Od and his liking for fresh and natural ingredients, typified by a bright, fresh tomato. Another oddly named restaurant is Ocken, this time the name coming from a portmanteau of octopus and chicken, and which is making creative dishes from humble ingredients sourced from around the world. Fresh and sometimes humble ingredients are sourced from artisan producers in Thailand for Taan, the menu even detailing the distance between the source of supply and the kitchen. Finally, we spent an evening at The Reflexions in The Athenee Hotel, which we remember from the time the hotel first opened but which has in recent years changed entirely to now serve very classy contemporary French cuisine. There is so much happening in Bangkok, and as always we are looking forward to next month’s excursions. Meanwhile, happy explorations! Californian-style Mexican food that started out in Hong Kong and now has three outlets in Bangkok. Ocken is a neighbourhood restaurant on Sathorn whose food is based on humble and natural ingredients from around the world, with the chefs creating dishes that are open to influences from all corners of the globe. Mod Oz cuisine that reflects Australia’s diverse culture and which is served in a minimalist setting tucked at the foot of a new condominium development on Soi 24. 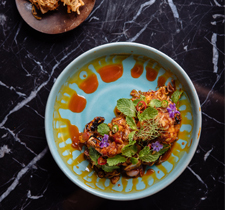 Under the term hyper-local, Taan sources all its ingredients from small producers throughout Thailand, and presents a 100 percent organic menu of distinctive Thai food. Modern French cuisine prepared by Chef Roxanne Lange and served in an elegant setting at the recently refurbished The Athenee Hotel.